*** Please note the Change of Time to 2:00 pm. 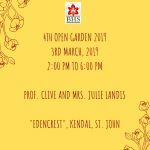 This lovely garden on the cliff at Kendal commands a panoramic view of St. Philip from Skeete’s Bay, Sam Lords and the Crane in the east to the Airport and parts of Christ Church in the south. 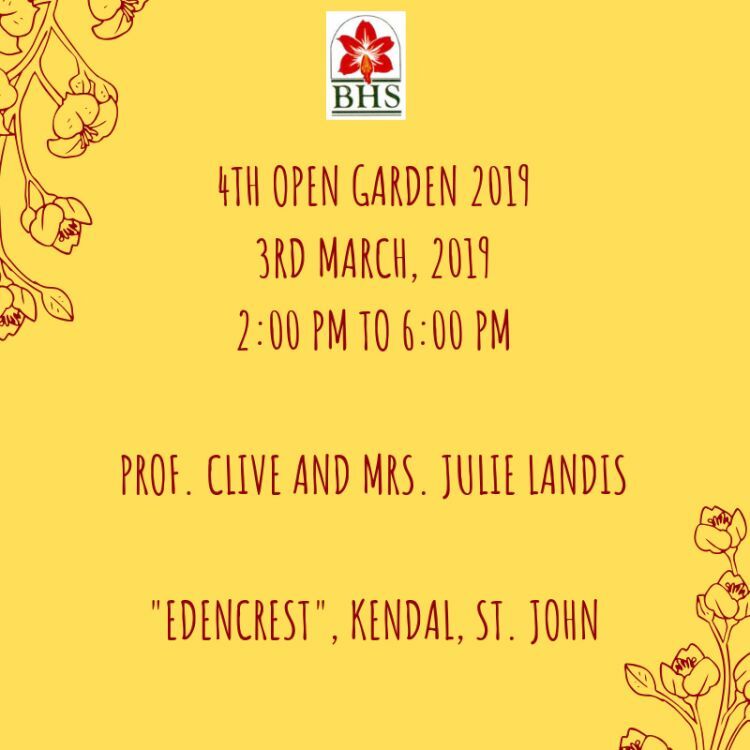 The garden has been beautifully and lovingly planned and landscaped by Mrs. Julie Landis whose love of gardening and nature is evident throughout. All along the driveway on one side is a continuous border planted with an interesting collection of colourful shrubs and smaller flowering plants clamouring to be seen, while on the other side an expansive lawn is dotted with a variety of trees, including Ylang-Ylang, Cassia, Fat Pork, Pommegrante. Half way along the driveway Julie has assembled an interesting collection of orchids. At the end of the driveway is a large Pomerac tree surrounded by red and white ginger lilies while the parking area is bordered with huge crinum plants that compete for attention with red feather grass and yellow margaritas. 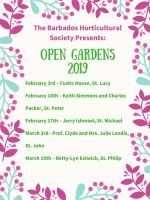 Follow the path through Julie’s vegetable garden to a new terrace with an abundance of ornamental pineapple plants and bromeliads then continue up to the brow of the hill with the outstanding view of the countryside. From there one enters the panoramic section of the garden where Julie’s full creativity can be seen. Julie has added several arches each with a different flowering vine including the Wing Bean – all parts of which are edible, while a Chalice vine covers the arch over the new wooden bridge leading to the swimming pool. Many small seating areas, each with their own design and plants, garden ornaments and benches, most of which have been made by Julie’s brother, add unique aspects to each section of the garden, inviting the visitor to sit, admire and enjoy the surroundings. The assortment, varieties and types of colourful shrubs and flowering plants are too numerous to mention. The garden overlooks a pristine swimming pool with Gazebo and Terrace where teas and cool drinks will be served. From the roundabout at Six Roads take the exit to Sunbury Great House and St Philip’s Parish Church. At the church turn left at the “Y” then turn right on to Highway 4B opposite Chapel Plantation, immediately after Halton Great House turn right at the sign “Kendal via Featherbed Lane” and follow the road up the hill (there will be a hedge of red and white/green shrubs on your left) continue on this road until you see the BHS yellow Open Garden sign positioned at the junction leading to the garden. 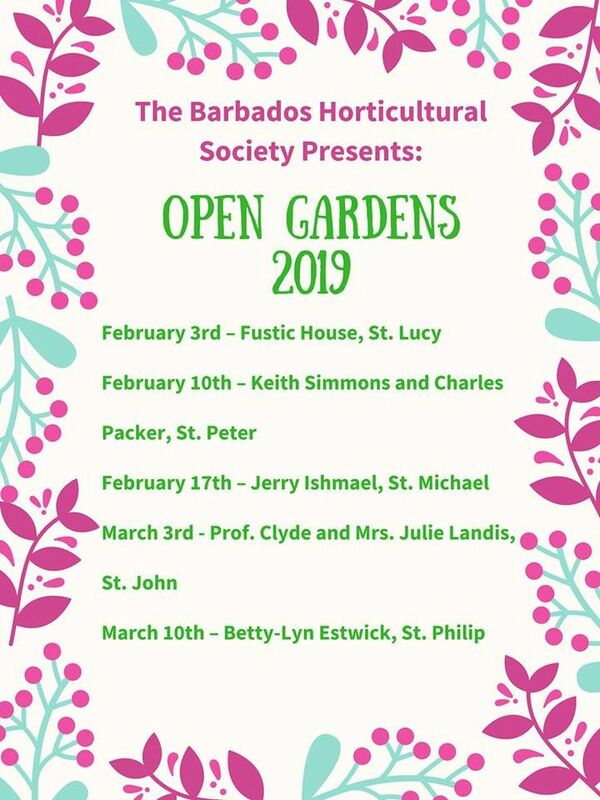 BHS members will be on hand to guide and assist and parking will be at St Gabriel’s Anglican Church. Highway 4B from Brighton, St George is closed to traffic so please follow the directions above from Six Roads in St Philip.